My family recently had the opportunity to try the 4 flavors of Fruit2day. 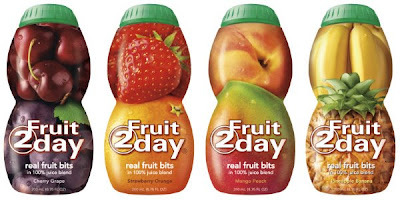 Fruit2day is a drink that is a combination of real fruit bits, rich puree and a splash of natural juice. My 14 yr old and 2 year old are great eaters and eat anything, but my 10 yr old is a different story, if it is not junk food or mac n cheeses he does not want it. I have the hardest time getting him to eat anything good for him. When I gave each of the boys a bottle to try of course my old and youngest drank it down in fact my 2 yr old was crying and screaming at my oldest for his bottle..... he wanted MORE. To my surprise my 10 yr old gave Fruit2day a "thumbs up" ! He even asked if I could get some the next time I go to the store, of course I responded with a BIG yes ! Fruit2day provides natural fruit nutrition without peels, pits, bruising, spoiling or even sticky fingers. pieces, fruit puree and fruit juice without any added sugar or preservatives. Portioned Nutrition - Each bottle of Fruit2day packs in two servings of fruit and antioxidants in 6.75 ounces, with only 110 - 120 calories, depending on the flavor. It is an excellent source of vitamin C that provides consumers half of their daily fruit requirements, giving them nutritious snack anytime of the day. Portable - Fruits that need to be peeled, pitted, sliced or eaten with a fork make it difficult for people to eat on-the-go. Fruit2day's portable bottle is perfectly suited for anytime, fruit snacking. The fun packaging really caught my eye ! I think it would be attractive to adults and children a like. This would also make a good addition to lunch bags for anyone. Fruit2day can be found in grocery stores, natural food stores, and mass merchandisers. This sounds interesting- thanks for the review! My son will eat fruit in any form, but it's not always easy to have on hand when we're out and about. I have 8 grandkids and they all love fruit! I bet they would love these. My son would love these I think!